Stephanie graduated from Victoria University with a Bachelor of Applied Science and a Masters of Osteopathy. From this she has gained experience managing the health of people from every age bracket and treating severe acute injuries as well as chronic injuries. Her treatments are particularly focussed on locating the structural and biomechanical causes of injuries and addressing them. As part of her master’s degree, she completed her research project on the physical, emotional and behavioural impact of chronic pain. 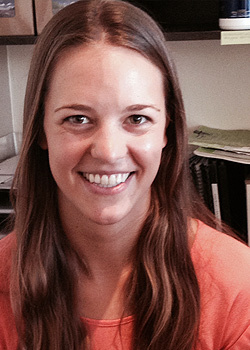 Since completing her studies, Stephanie worked in a private hospital in Mumbai, India. During this time she worked alongside some of the most renowned orthopaedic surgeons and physiotherapists in the country to provide patients osteopathic care and assist in their rehabilitation. She thrived on working as part of a team environment focussed on improving the health and wellbeing of the patient. Stephanie has also worked as a sports trainer in both the Victorian Football League and the Victorian Amateur Football Association for three years. Her work in this field has led her to develop a passion for exercise rehabilitation and has now undertaken further studies in clinical pilates. Stephanie’s osteopathic and pilates training enables her to equip patients with the tools they need to take an active role in their own health care. Stephanie maintains a very active lifestyle, participating in yoga and swimming on a regular basis. She also has a keen interest in travel and as a result took time off in 2012 to explore Canada and Europe. Most recently, she took part in a volunteer program in Cape Town, South Africa promoting health and hygiene amongst the communities.